It’s Day Four of British Flowers Week, an industry-wide, nationwide campaign in support of British cut flowers, founded and organised by New Covent Garden Flower Market. How long have you been using British flowers? I’ve always used British flowers. Before I set up my business, I used to pick flowers from my garden and practise making arrangements. Jay Archer Floral Design officially started in 2011 when I did the wedding flowers for one of my friends using homegrown blooms. 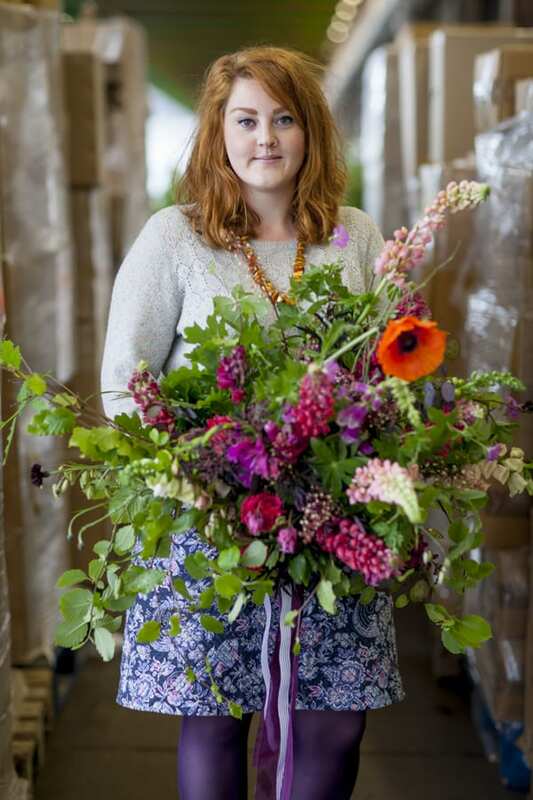 I love the style you can create using native flowers and I source British flowers from Zest Flowers and Pratley at New Covent Garden Flower Market, as well as continuing to grow my own. Could you tell use about the three designs which you’ve made exclusively for British Flowers Week 2015? I’ve made an urn design, bridal bouquet (pictured below) and ceremonial arch. Your chosen flower for British Flowers Week is the lupin. Could you tell us why you selected it? Compared to the Dutch lupins which are usually straight, upright and purple, British lupins tend to be quite quirky and more characterful. Their flower heads can be twisted and their tips resemble little flicks of a fox’s tail. Homegrown lupins are available in a range of colours and their foliage is generally more dense. Apart from the lupin, which are your other favourite British flowers? I love sweet peas and they feature in my business logo. My granddad used to grow them and they were his prized possessions. They’re such a small, unassuming flower that gives out such a scent. I also love British dahlias and buy them from Alagar at New Covent Garden Flower Market. Plus there’s wonderful British foliage, which I buy from GB Foliage. 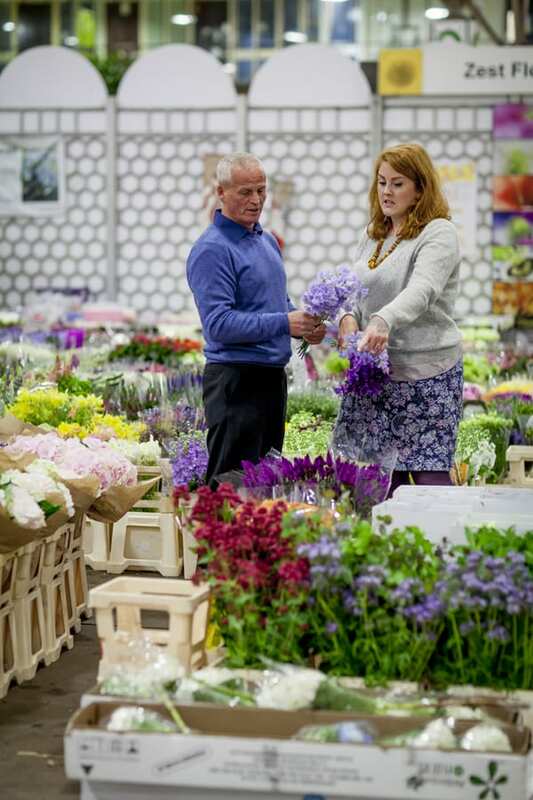 Do your customers ask for British blooms? Yes, my brides ask for British flowers, which I think is because I promote and recommend them. They tend to be fresher than importer blooms and can last longer. Why do you love British flowers? I’m passionate about British flowers. They’re a completely different product to imported blooms. I find their unpredictability and lack of uniformity exciting. They also look more natural and remind you of hedgerows when you’re on holiday. If you’re a florist and are nervous about trying them, simply accept that they are a different product, have a go and keep an open mind. 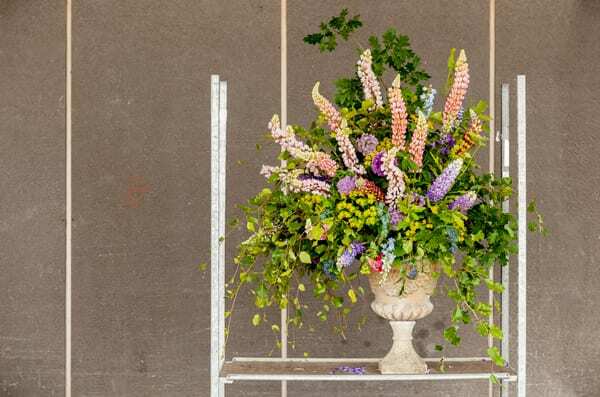 Do check out the new British Flowers Week website for three blog posts featuring Jay and lupins. And tomorrow, look out on Flowerona for the last florist and British flower…!